A barquentine motor-sailing yacht - the only yacht in the Galapagos that can navigate under sail. Ideal for single travellers. The SS Mary Anne is the only 3 mast barquentine sailing ship in the Galapagos Islands, making her the perfect choice for lovers of sailing ships. Guests enjoy the informal atmosphere and genuine windjammer experience of sailing around the Galapagos Islands. Operated by one of the pioneers of Galapagos Islands cruising, you can be rest assured of a luxury and quite special experience, both on board ship and on the daily excursion programme. Launched in 1997 was designed specifically with environmentally friendly operations in mind and is certified by Smart Voyager. Because she has both motor and canvass sails, she is not constrained by the direction and strength of the wind, but when the wind is favourable the crew (with your help if you want to get involved) will rig her up and she will travel under sail - a quite wonderful way to explore the islands. 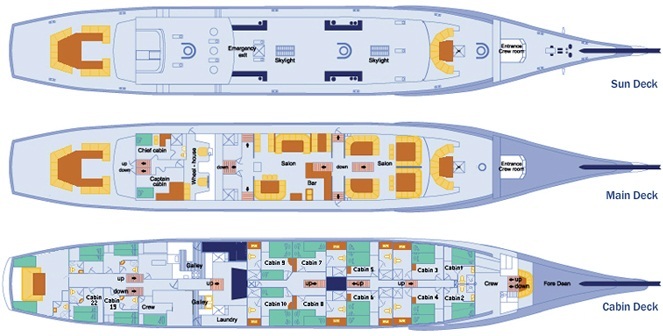 She can accommodate up to only 16 passengers in 12 double, tastefully furnished cabins. It really is a personalised, small group experience. The vessel has a spacious feel to it: with a dining room, library, kitchen, comfortable lounge, entertainment area and cosy bar on the main deck and ample sun decks with seating and kayaks for your use during the cruise. Al fresco dining is also available on the sun deck. The Mary Anne offers single cabins without supplement, making her the ideal choice for single travellers. We start with a visit to the Charles Darwin Research Centre and the Fausto Llerena Breeding Centre, to see tortoises from across the different islands. We then board the SS Mary Anne with a welcome dinner and introductory briefing. The second day is spent on Floreana Island, starting with the beautiful beach at Punta Cormorant and the chance to see greater flamingos, sting rays and sea turtles nesting grounds. A panga ride then follows to Devil's Crown, where we have our first snorkelling opportunity. In the afternoon we visit Post Office Bay, where you can take one of the letters or postcards to hand-deliver to someone near your home and perhaps live one in the hope someone does the same. We start the day on the black beach of Floriana to learn about the history of human inhabitants in the archipelago and then the Asilo de la Paz fresh water source and caves, once used as pirate hideouts. The afternoon is then dedicated to exploring the marine reserve waters of the Galapagos, looking for different species of whales and dolphins, whilst travelling between Floreana and the volcanic landscapes of Isabella. Disembark at Punta Moreno and admire the spectacular lava flows, surrounded by volcanoes. We undertake a short hike to a nearby lagoon to look for the flamingos, herons and pelicans that frequent this beautiful area. Later that day we take a panga ride around Elizabeth Bay, another picturesque lagoon, fringed by the archipelago's largest red mangroves. Sea turtles, flightless cormorants, blue-footed boobies and penguins are commonly seen around here and it is possible to see humpback whales breaching. Our tour continues at Urbina Bay, which experienced a major geological 'uplift' about sixty years ago, leaving behind interesting coral and marine fossils for us to admire. There is also a black sand beach here that is a nesting site for green sea turtles, whilst inland we can see land iguanas and giant tortoises (depending on season). The waters here afford some great snorkelling. In the afternoon we make the short crossing to Fernandina, the archipelago's youngest island. We disembark at Punta Espinoza to spot flightless cormorants, sea lions, penguins, hawks, marine iguanas and Sally Lightfoot Crabs. The morning is spent exploring Taguas Cove, another former pirate hideaway, where the names of their boats are inscribed in the cliff face. The highlight here is the beautiful Darwin Lake, a salt-water lagoon which fills a volcano crater. We then take another panga ride around the coastline and enjoy some of the best snorkelling in the Galapagos. The underwater cliffs are brought to life by the dazzling colour of the marine life below. The penultimate day is spent exploring Santiago island, starting at the golden sands of Espumilla beach, another green sea turtle nesting site. From here, we follow a forest trail to spot yellow warblers, Darwin finches and the Galapagos flycatcher. The afternoon brings a visit to Puerto Egas, a volcanic beach populated by Galapagos fur seals, Sally Lightfoot crabs and marine iguanas. The shore is home to an abundance of marine and bird life and features an impressive natural lava arch. The cruise ends at the small island of North Seymour, a haven for frigate birds, blue-footed boobies and swallow-tail gulls, who have their largest nesting sites here. Return to Baltra Island to disembark and transfer to the airport. Please enquire for information on 5-Day, 6-Day, 10-Day, 11-Day and 15-Day itineraries for Mary Anne. In the morning, travel to Genovesa Island and reach Darwin Bay (wet landing), a unique site lined with red mangroves and soft-haired prickly pear cacti where red-footed boobies and great frigate birds perch tamely. After lunch, visit Prince Philip Steps, we climb the edge of a cliff where frigate birds, masked boobies, and red-footed boobies nest. We will be seeking out the impressive red-billed tropicbird amidst Galapagos storm petrels. A dry landing at Isla Bartolome to climb up the wooden steps and reach the summit of this spatter cone for a breathtaking panorama of the island’s photogenic Pinnacle Rock, with views of neighbouring Santiago and many other central islands in the distance. In the afternoon, head across to Sullivan Bay in Santiago to walk over a recent lava flow, including very fresh pahoehoe lava formations, lava bubbles containing crystallised minerals, and pioneer plants. Along the shoreline, we may find Galapagos penguins and herons going after small fish. Morning wet landing onto Rábida’s deep-red beaches to explore the red island’s fascinating interior and saltwater lagoon. Darwin’s finches, Galapagos mockingbirds, and yellow warblers feed off the vegetation. Given the right time of the year we may see brown pelicans nesting on salt bushes that fringe the beach. After lunch, we head across to Cerro Dragón on Santa Cruz’s northwest shore to visit a saltwater lagoon, home to Greater Flamingos, black-necked stilts, and white-cheeked pintails. Further inland we find a fantastic land iguana nesting site. We will spend this day visiting Santa Cruz Island´s most famous highlights. We arrive at Puerto Ayora and travel to the island’s highlands. This area, in contrast to the coastal region, has lush vegetation and forest due to the humidity that gathers in the higher regions. We will visit one of the ranches of the area where it is possible to see giant tortoises in their natural habitat. As these animals migrate from the coastal area to the highlands and back, the chosen ranch will depend on the presence of the tortoises, as they roam free and change locations. This is also a good place to see the Galapagos hawk and barn owl of this island and the surrounding forests are filled of birds such as the vermilion flycatcher or the yellow warbler. Enjoy lunch at the ranch to then head back to Puerto Ayora for our second visit of the day, the Charles Darwin Research Station and the Fausto Llerena Breeding Centre. Here we will see tortoises from different islands. The animals are found in large semi natural pens for their protection, but also to ensure an easy view for the visitors. The pens are divided according to four different stages: eggs, neonates, juveniles (held here until they are mature enough to be "repatriated"), and adults. After this visit, we will have some time to explore the town of Puerto Ayora and its many souvenir shops, before boarding the Mary Anne for dinner and the evening briefing. We visit one of the oldest docks of the archipelago, colourful Plaza Sur - home to vibrant green prickly pears, deep red Sesuvium and coppery-orange land iguanas; impressive seaward cliffs are excellent for a variety of coastal birds. This is also a great place to observe the adult and pup sea lions swimming along the shores. After lunch, arrive on Santa Fe onto a white beach where sea lions are usually resting, we will be looking for the endemic species of land iguana, larger and yellower than land iguanas on other islands. The largest prickly pear cacti in the Galapagos are also found here. Morning exploration of Punta Suárez, a spectacular walk providing insights into the intimacies of life at sea, with nesting sites of blue-footed and Nazca Boobies, as well as the fascinating breeding rituals (April to December) of the waved albatross. Lined with neon-coloured marine iguanas (January), and lazy Galapagos sea lions, we walk up to an amazing viewpoint of the famous blowhole. Spend the rest of the day on fantastic Española, starting with Gardner Bay (wet landing), an outstanding beach with sea lions, marine iguanas, and the intrepid Española Mockingbird. This is our last day in the islands. After breakfast we will disembark in Puerto Ayora to take our transport to Baltra Airport, doing a short stop to visit the Twin Craters. The Gemelos (twins) are two deep craters located to the side of the road that leads to Puerto Ayora from the other side of the island. These huge holes were created in a volcanic explosion or by magma chambers underneath the island´s surface. This is also a good place to see the Galapagos hawk and barn owl of this island and the surrounding forests are filled of birds such as the vermilion flycatcher or the yellow warbler. After this visit we will make our way to the Baltra airport for the flight to mainland Ecuador. The enchantingly romantic SS Mary Anne will stop the breath of every sailor or sailor at heart. With over 1000 square metres of sail, she majestically parts the waves with full canvas sails or by motor. Due to its steel hull, tall masts and deep draft, the Mary Anne is one of the most stable vessels in the islands and navigating with full sails, you will enjoy traveling without the sound of engines, often attracting dolphins and whales. Up to 16 guests are comfortably accommodated in 12 air-conditioned double cabins, each with a private bathroom. Relax in the rich wood-panelled lounge or library (with TV and video equipment); let yourself unwind on the sundeck as you take in the fresh sea breezes. Since the SS Mary Anne features a full crew of eight, you can rest assured that every aspect of your cruise from the delicious food, informative nature presentations and expertly guided shore excursions will be carried out expertly and personally. With 6 single cabins available with NO SINGLE SUPPLEMENT, a cruise on the SS May Anne is the perfect choice for single travellers. Library and spacious decks to relax. Fully air-conditioned, private rooms with bathrooms. Stunning barquentine sailing ship with over 1000 square meters of sail. Kayaks on-board for your use. Transfers to/from the ship from the Galapagos Airports. All excursions as described in the itineraries. FREE use of snorkelling equipment and kayaks. There are 12 air-conditioned guest cabins, all located on the cabin deck. 10 have double lower and single upper berths and 2 (9 & 10) have double lower berths and no upper berths. All have a porthole (rather than full size window), closet and private shower room with hot and cold running water. Some of the cabins are usually used for single occupancy, with no extra supplement - please call our specialist travel advisors for details.